View of the village of Grange in Cumbria, Northern England. 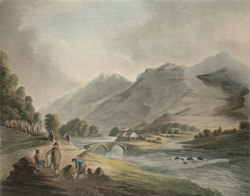 An anonymous author wrote the following words about Grange in the book ‘Echoes of the Lakes and Mountains or Wonderful things in the Lake district’, published in 1880 ,” Grange, a small village, is delightfully situate on the west side of the river Derwent, about a mile above its entrance into the lakes. It is about 4 miles from Keswick… Castle-crag, under which lies this sweet village, appears in the centre of an amphitheatre of mountains threatening to block up the pass into Borrowdale. The Saxons in turn occupied the fortress, and it was given with all Borrowdale to the Monks of Furness. The Grange was the place where they laid up their grain, and also the salt they made at a salt spring…”.